The light-years long plume of ionized gas from this red giant star provides evidence suggesting its electrical nature. NASA launched the Galaxy Evolution Explorer (GALEX) spacecraft on April 28, 2003 from the Cape Canaveral launch facility in southern Florida. Equipped with advanced near and ultraviolet detectors, GALEX was scheduled to remain in orbit for about 29 months studying galaxies in the hundreds of thousands. The mission has been extended and GALEX continues to return images such as the one of Mira, a red-giant star with a trail of material extending from it for about 13 light-years. In previous Thunderbolts Pictures of the Day, several different kinds of objects with long "tails" have been considered. From galactic-scale objects such as Centaurus A, to hot-bright stars, to planets, to comets it seems as if everything we study exhibits an energetic component that is very difficult, if not impossible, to explain according to conventional theories. It seems as if every new observation requires a new piece be added to the theory, or a revision, or an admission of complete bafflement. It is the heart of science to say, "I don't know" and then proceed from that platform of ignorance into discovery. NASA scientists say, "we know how the universe works - it's gravity, baby and that's it." Or, "there is no electricity in space and even if there were, it isn't doing anything," as one correspondent claimed. Except that the things and events they record with their instruments deny such assertions. Mira is a case in point. The star, Mira, is in reality a pair of stars orbiting a common center: a binary star. Mira A is a red giant star and Mira B is most likely a white dwarf, or perhaps a more normal star in the sequence, the data is still being considered. Mira A is a variable star and was the first one discovered that was not the remnant of a "supernova" explosion. As has been previously considered in these pages, such double stars (and other multiple star systems) are indicators that excessive electrical charge has resulted in stellar fissioning. The same process can also explain the supernova phenomenon, except on a more dramatic scale. "'I was shocked when I first saw this completely unexpected, humongous tail trailing behind a well-known star,' said Christopher Martin of the California Institute of Technology in Pasadena, Calif. 'It was amazing how Mira's tail echoed on vast, interstellar scales the familiar phenomena of a jet's contrail or a speedboat's turbulent wake.' Martin is the principal investigator for the Galaxy Evolution Explorer, and lead author of a Nature paper appearing today [August 15, 2007] about the discovery ...."
"Astronomers think hot gas in the bow shock is heating up the gas blowing off the star, causing it to fluoresce with ultraviolet light. 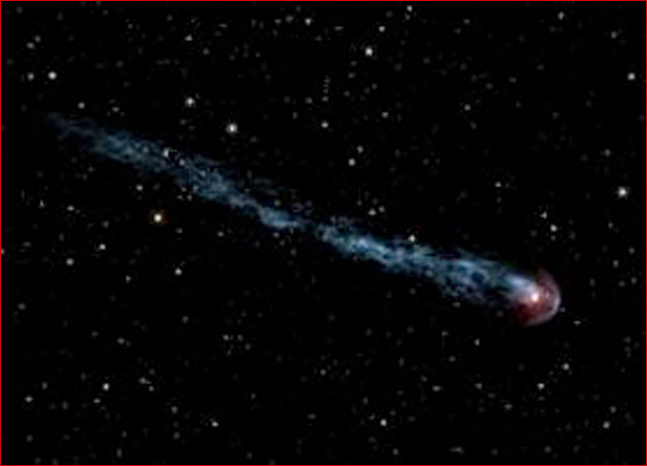 This glowing material then swirls around behind the star, creating a turbulent, tail-like wake. The process is similar to a speeding boat leaving a choppy wake, or a steam train producing a trail of smoke." "The process providing the best fit to the grism image is H2 emission. It also produces no detectable counterparts at other wavelengths. The far-ultraviolet emission cannot be fluorescence of H2 excited by the ambient interstellar ultraviolet radiation field because this fails to produce the observed brightness by more than a factor of seven. Rather, we propose that the emission is excited collisionally by the interaction of H2 in the cool wind wake with hot electrons in the post-shock gas resulting from the bow shock that also entrains and decelerates the wind." Preferring to explain the energetic emission of ultra-violet light and the expulsion of what for all intents and purposes is a jet of material being ejected from Mira as "speedboat wakes" and "contrails" and "smoke'" they miss important clues about what is actually causing both manifestations: electrical transmission across vast distances through Birkeland currents in ionized, dusty plasmas. Since wakes, contrails and smoke all tend to spread out as they move away from the source, the tail streaming back from Mira cannot be a mechanically produced phenomenon. Mira's tail is highly organized along its entire 13 light-year length into what appears to be a twisted helix, an indication that it may indeed be a Birkeland current. new discoveries and the explanatory power of the Electric Universe." The Electric Sky and The Electric Universe available now! 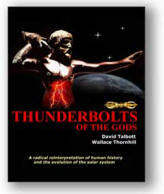 Authors David Talbott and Wallace Thornhill introduce the reader to an age of planetary instability and earthshaking electrical events in ancient times. If their hypothesis is correct, it could not fail to alter many paths of scientific investigation. Professor of engineering Donald Scott systematically unravels the myths of the "Big Bang" cosmology, and he does so without resorting to black holes, dark matter, dark energy, neutron stars, magnetic "reconnection", or any other fictions needed to prop up a failed theory. In language designed for scientists and non-scientists alike, authors Wallace Thornhill and David Talbott show that even the greatest surprises of the space age are predictable patterns in an electric universe.